Author(s): Anshu Dandia, Ruby Singh, Shuchi Maheshwari. Department of Chemistry, University of Rajasthan, Jaipur, India. Pyridines and their derivatives with various functional groups possess diverse therapeutic and industrial importance. Malononitrile is a versatile reagent in organic chemistry and widely used in various multi-component reactions as a one component for the synthesis of diverse bioactive heterocycles. 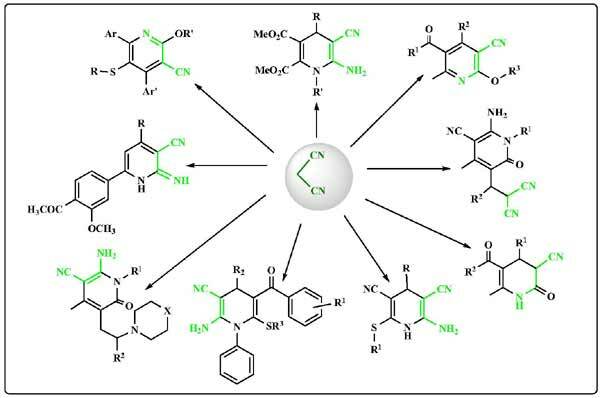 Malononitrile showed exceptional reactivity than other active methylene group containing compounds due to the presence of two electron withdrawing groups. In this review, we wish to report the MCRs for the synthesis of various functionalized pyridines in which one of the starting materials is malononitrile. The present review is focusing on reports from 2006- 2013. Keywords: 1, 4-dihydropyridine derivatives, cyanopyridines, malononitrile, multicomponent reaction, pyridinones. Affiliation:Department of Chemistry, University of Rajasthan, Jaipur, India. Keywords:1, 4-dihydropyridine derivatives, cyanopyridines, malononitrile, multicomponent reaction, pyridinones. Abstract:Pyridines and their derivatives with various functional groups possess diverse therapeutic and industrial importance. Malononitrile is a versatile reagent in organic chemistry and widely used in various multi-component reactions as a one component for the synthesis of diverse bioactive heterocycles. Malononitrile showed exceptional reactivity than other active methylene group containing compounds due to the presence of two electron withdrawing groups. In this review, we wish to report the MCRs for the synthesis of various functionalized pyridines in which one of the starting materials is malononitrile. The present review is focusing on reports from 2006- 2013.